For Filipino children, Christmas—the day they have been waiting all year long—culminates in one whole day of seeking their godparents for aguinaldo. After that day, it’s pretty much over for them. On to the next celebration which is counting down to a new Year. 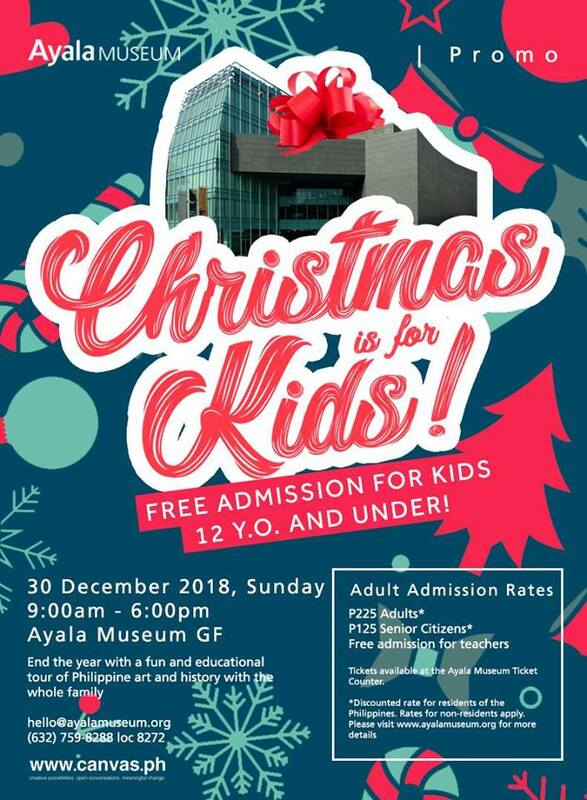 Except this year, Christmas for the kids will extend up to the end of the month (well, almost) with the Ayala Museum offering free admission for the young ones to their exhibits this Dec. 30, which coincides with the commemoration of Dr. Jose Rizal’s death. From 9 a.m. to 6 p.m., kids will be treated to an educational and fun tour of the displays in the museum. From the collections of Fernando Zobel artworks to the famous dioramas depicting the history of our nation, there is so much in store for the young visitors. Youngsters looking to take advantage of this promo will also have another reason to wake up early on a non-school day as the first 100 kids to enter the museum will get a free storybook courtesy of Center for the Art, New Ventures, and Sustainable Development (CANVAS), a non-profit organization advocating for the promotion of Philippine art, culture, and the environment. For the adults, admission rates are P225 for regular visitors and P125 for senior citizens. For more information visit the Christmas is for Kids event page on Facebook.